Defender Cu - Kenya Biologics Ltd.
DEFENDER Cu is a product developed for the prevention and correction of copper deficiencies in crops. The formulation contains long chain sugar acids to ease absorption of copper within plant tissues and assimilation in roots. Copper catalysis several enzymatic reactions of plant metabolism, is a constitutive element of ascorbic acid and phenol oxidases, the cytochrome and the electron transport system of photosynthesis. Copper favors nitrogen utilization and protein synthesis and acts as a chlorophyll stabilizer. Copper deficiency symptoms usually occur with leaf necrosis (wilt). The quality and yield of fruits decreases while abnormal coloring and development of affected plants becomes evident. 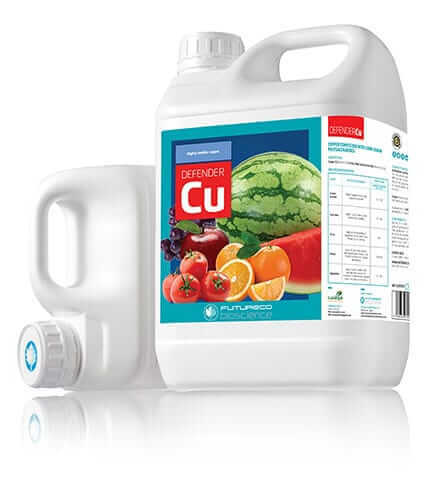 DEFENDER Cu is a novel formulation to ease absorption and availability of copper within plant tissues. DEFENDER Cu is recommended for prevention and overcoming of copper deficiencies. Application rates vary according to deficiency severity, climatic conditions, soil type, etc. Apply using enough water to completely wet all foliage. DEFENDER Cu can be also used dissolved in drip irrigation water. DEFENDER Cu is stable for at least three years since manufacturing date. Store in the closed original container in a cool, well ventilated area. DO NOT store for prolonged periods in direct sunlight. Keep away from food, drink and animal feedingstuffs. Keep out of the reach of children. Do not mix with mineral oils, bentazone, calcium polysulphur, clopyralid or diazinone. Application rates and moments should be carefully selected in function of deficiency level. Inexperienced users are requested to get in touch with Technical Department of the Manufacturer or Distributor. Contains cytokinins, gibberellins and auxins at low concentrations in the ppm range. Composition is subject to change according to local regulations for such products. Horticultural crops or vegetables 100 – 120 Apply 4 and 5 weeks after transplantation or at first symptoms of deficiencies. Repeat every 7–10 days as necessary. Grapevine and kiwi 150 Make 3 applications during vegetative growth. Fruit trees 100 – 150 Apply in pre-flowering and before buds swelling. Citrics 300 Apply at the beginning of vegetative activity and at pre- flowering and setting. Blueberry, raspberry, strawberry 200 – 300 Apply during pre-flowering, setting and fattening of fruits. Potato 300 – 400 Apply 30 days after sowing and repeat every 15 days or at first symptoms of copper deficiencies. Do not apply to flowering periods. Do not apply on copper sensitive varieties.